Cocktails can be the perfect ice breaker or finish to a long day. A classic martini, a refreshing gin and tonic or maybe the sophisticated Old Fashioned but what happens when you are having a party and are planning out cocktails for your guests? For me, I often shake or stir cocktails to order, especially if it's a small gathering. 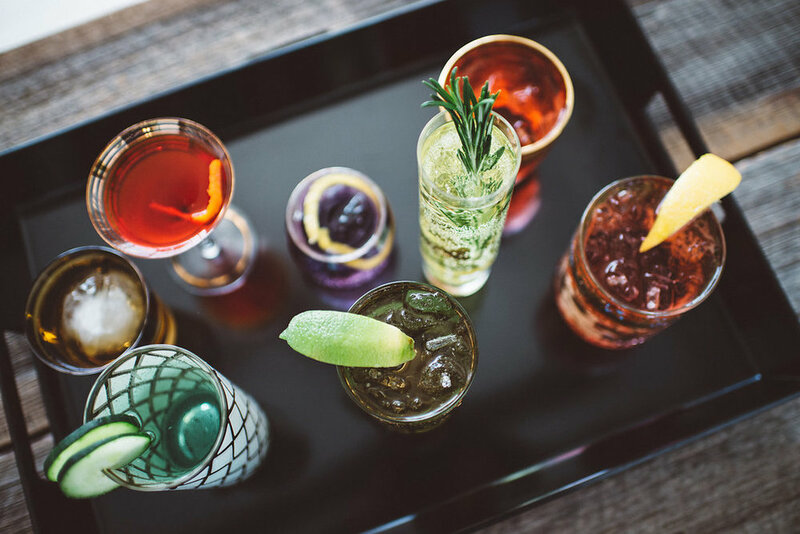 For those times that the party includes 10-20 guests (or more), being behind the bar means you don't really get a chance to enjoy the party and mingle with your guests. To make your next gathering a little less stressful and a lot more enjoyable, I've put together a couple of cocktail recipes that will make your guests happy and let you enjoy the festivities as well (win-win!). The measurements I provided are for 10 cocktails. These can easily be doubled or tripled for even larger gatherings. Following each batch cocktail, I've provided the measurements for one cocktail, so even if you're not having a party you can still enjoy these great cocktails! Party tips: In addition to a few batched cocktails, I always have beer and a nice chilled wine for the hot weather months. A beverage dispenser with ice water and lemons will help keep your guests hydrated between cocktails. And for the non-drinkers, omit alcohol and add seltzer water to the recipes below. Check out our Batched Cocktails for a Crowd segment on New Day Cleveland! Directions: In large pitcher, drink dispenser or punch bowl, add sweet tea syrup, lemon juice, bourbon, Crude Smoke & Salt bitters and peaches. if you're adding the basil, give it a whack against your hand before you add it to the pitcher and LIGHTLY muddle it (just enough to release the oils). Stir well and serve! I recommend slicing the peaches and placing them in the bourbon at least a few hours prior to serving... this adds more peach flavor and makes those pretty little peaches a boozy treat. The bitters are pretty amazing in this drink they remind me of drinking a cocktail near a beach bonfire, adding a hint of smokiness and a wisp of sea salt. To serve: Place an ice bucket and cups next to the premixed cocktail. You can add ice to the pitcher before serving but be aware that as the ice melts the cocktail will become watered down. A ladle or large spoon also comes in handy for your guests to fish out the boozy peaches. For a non bourbon version, check out the recipe below. Recently my husband and I were invited to a get together with friends. I was asked to bring the cocktails, the twist... that they NOT taste like alcohol.... Say what?!? Hmmm, a challenge for me, especially since I prefer boozy and oftentimes bitter forward cocktails. Sometimes you just do what you gotta do! After all, it's all about making sure your guests have a great time. I accepted the challenge and put together this peachy little gem :) They LOVED IT! I have a feeling that if you're not a bourbon lover, you'll enjoy it too! Follow the directions above. Be sure to soak the peaches in the peach schnapps for that extra little boozy treat. Add ice to your pitcher for even less boozy taste. Directions: In a large pitcher or drink dispenser, add passion fruit syrup, lemon juice and rum. Add a cup of ice to help agitate the mix. Stir really well. To Serve: Place an ice bucket and cups nearby and guests can help themselves. You can add ice to the pitcher before serving but be aware that as the ice melts the cocktail will become watered down. Ultimately rum is the traditional spirit for this sweet, tart tropical cocktail but if you and your guests prefer a different spirit the following variations make a tasty summer cocktail as well. Being that Vodka ranks as #2 for liquor sales in the world, I'd be remiss if I didn't include a vodka variation. Same recipe just swap the rum for vodka. And because margaritas are perfect for hot summer months, here's another variation ...swap out the rum for a nice silver or reposado tequila and use lime juice instead of lemon. How much alcohol do I buy? An important part of any get together is to ENJOY! Laugh with your friends and family and don't sweat the small stuff! Even more important... no drinking and driving! Plan a sleepover or download one of those handy transportation apps before you imbibe. Hope these recipes help make your next party fun & stress free! Posted on July 25, 2017 by Marie Teckmyer and filed under cocktail recipes, bourbon Cocktails and tagged new day cleveland cocktails Peach tea bourbon bourbon smash peach bourbon smash tea cocktails sweet tea cocktail bourbon cocktail passionfruit syrup cocktail batched cocktails wedding cocktails signature cocktails cocktails for a party labor day cocktails tailgate cocktails peach cocktail vodka sour passion fruit margarita happy hour collection happy hour cleveland liber & co jack rudy cocktail co jack rudy sweet tea syrup liber & co passionfruit syrup.